At 19 weeks pregnant, we went in to our anatomy scan excited to find out if we were having a boy or a girl. We found out but were also devastated with the news that our unborn daughter had a congenital diaphragmatic hernia (CDH). Our doctor told us there was a strong chance she would not live. He said they would run every test they could and then we would need to make our decision on how to move forward. We felt cheated, we felt like we were being punished, we felt angry. For weeks I felt like I was living someone else’s life. For a long time I resented people in my life with healthy children. I resented people’s “little” problems. I felt sad, and at times, I felt truly hateful. But sometimes, after you picked up the broken pieces of your heart, you’re left with a better one. Summer has made me a better person, a more patient person and a better wife and mother. People ask us how we do it, if we’re exhausted being new parents and if there are days we want to rip our hair out. Maybe, but mostly no. We’re happy. We’re happy every day. She has brought to life what is truly important. Our house is not always clean and organized. Our schedules are sometimes a mess. No my hair isn’t washed and curled, and yes, this is yesterday’s makeup. But my heart? My heart is full and calm. I can look at other families and truly be happy for them and their healthy children. I see that every problem in people’s lives are huge to them and hope they can find peace within them. Despite Summer’s challenges, she is completely perfect and amazing. Her easygoing disposition puts a smile on my face every day. Her happy smile lights up the room and can melt the coldest heart. She is pure joy despite her seemingly endless fight. Through hospital stays, clinic visits, therapy sessions and countless procedures, she perseveres and teaches us all how much we are capable of overcoming. I can’t imagine our life without her in it. Some days she can’t stop gagging, coughing and throwing up, and my heart skips a beat with panic. But some days she can’t stop smiling and giggling, and my heart skips a beat with happiness. Our life is about finding balance and appreciating every single day. Families receive life-changing diagnoses every day. Today I’m asking you to take a moment to think about them. Think about the dad who just found out he will have to bury his baby. Think about the mother of three who just found out her own mother is on her last option. Think about the person who is all alone fighting against cancer. Say a prayer, light a candle, send your juju into the universe. There’s someone who might need it right this moment. I still don’t know why this happened to us. We are just like you. We thought this kind of thing happened to other people and would never happen to us. But then it did. I learned lessons I never thought I would, and I learned lessons I really didn’t think I needed to learn. What I do know, though, is life can be messy for everyone. No one has it together all the time. Define what is important in your life and adjust your expectations. Be happy every single day. Michael and Cassie Fannin met their little hero, Summer, on January 23, 2015. 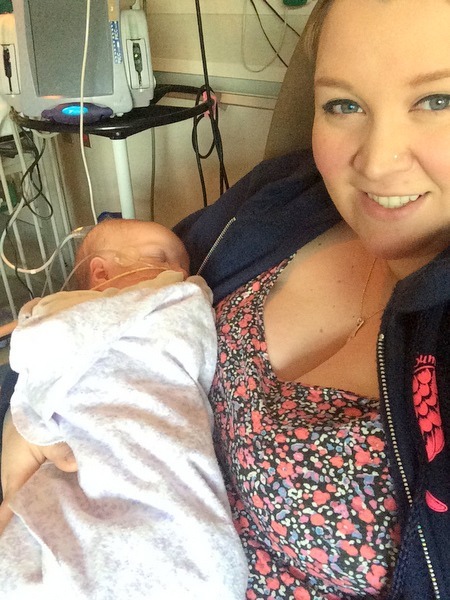 Summer was diagnosed with a congenital diaphragmatic hernia (CDH) in utero on September 5, 2014. Summer is a survivor of CDH, a birth defect with a 50 percent survival rate. She is a smiley, happy baby, and Michael and Cassie are completely smitten by her.